the ingredients for the walnut bella 'meatballs" may seem a little strange - but trust me on this, these will be the best balls you ever tasted. hmm that doesn't sound right...moving on. then formed into balls a heaping tablespoon at a time. gluten free option: replace the bread crumbs with a gluten free bread or leave out completely with the flax egg - minus these two ingredients will yield about 6 balls or 2 servings. the subs come together in about 30 minutes. you could easily bake up a batch over the weekend and reheat throughout the week. they would be perfect with pasta or on a pizza. this was the perfect Saturday afternoon lunch. hands down the best "meatball" sub i've ever had - i can't wait for leftovers tomorrow! for the walnut bella "meatballs"
finely grind the slice of bread into crumbs in a food processor - transfer crumbs to a small bowl & set aside. in the food processor, finely ground 1 cup walnuts, half of the mushrooms, seasoning & parsley until well mixed. the mixture should be a bit moist from the walnuts. transfer mixture to a medium mixing bowl. add dates and remaining mushrooms to the processor until well ground. with a rubber spatula transfer date/mushroom mixture to the bowl with the walnut mixture. add bread crumbs, olive oil, salt and flax egg - mix well. a heaping tablespoon at a time form a ball with the mixture - place on a parchment lined baking sheet. continue 12 times until all the mixture has been formed into balls. while the "meatballs" are baking - prep your veggies. in a medium saute pan over medium/high heat - add oil, once oil is heated add veggies and saute. caramelized bits are good. towards the last 2-3 minutes of cooking, add the balsamic to de glaze the pan. continue to cook until balsamic is reduced to 1/2 - you are looking to create a glaze of balsamic on the veggies. remove from heat and set aside. when you have about 2-3 minutes of cooking time left on the "meatballs" place 2 sub rolls cut side down on the upper rack of the oven. once the "meatballs" are done cooking, remove from the oven along with the sub rolls. allow the "meatballs" to cool for about 3 minutes. leftover "meatballs" can be stored in an airtight container for up to week and reheated as needed or frozen on a cookie sheet and stored in a freezer bag for later use. These look really great - and I love the simple ingredient list. I've played around with making 'meat' out of nuts befre, but these meatballs... with the portabella, and the seasonings, and the flax, and the dates... seriously making me salivate, over here. So jealous of your leftovers! LOL I just finished the leftovers with a bit of marinara sauce - OMG so good! wow, these look amazing! i used to love meatball subs..must try this one. I love that you repinned these as "for Dayv" - you are so cute! Is he a fan of "meatballs"? haha thanks! he told me recently he is more open to trying new foods, so i thought this would be a great thing to make. it looks delicious! wow...This looks delicious! Great idea. Do the date add a little sweetness? Just a hint of sweetness which gives the "meatballs" a great balance of savory and sweet, which I love! Shaking head in disbelief? Check. Pinned? Check. Telling Heather she needs to share her creativity in the Kitchen? YOU NEED TO SHARE YOUR CREATIVITY IN THE KITCHEN!!! Check. And you are pure awesomness for repinning! Wow, no Taco Bell... No meatball subs... what in the world did you eat? ;) These look delish by the way, and I've been looking for a new "meat"ball recipe, thanks! Oh Barb - believe me growning up I lived off of a partially horrible diet, peeps, little debbie snack and McD's - I just shake my head at how I use to eat years ago! You definitely have to try these Gabby- they are so addicting in a good way! I just found your blog from The Shiksa in the Kitchen. This is such an amazing idea. Dates are such incredible binders in raw dessert balls. I would have never made the conceptual leap to savory meatballs. Thanks for the inspiration! I love the binding quality of dates, they were a perfect addition to this recipe - I couldnt have been happier with the end result! What a clever idea! I agree with Cara - lots of creativity in the kitchen here! These look absolutely beautiful, though. 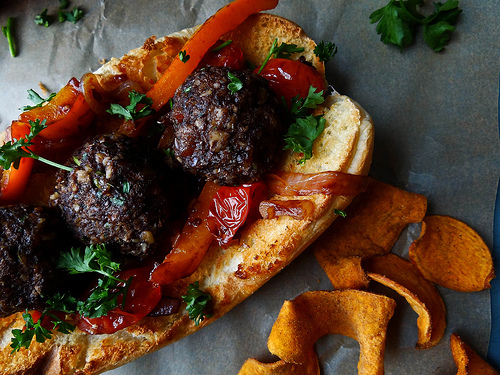 A tasty "meatball" sub made with walnuts (which I love)? I'M IN! The leftovers I had with Marinara - so good! I love how you created such a meaty meatball by using walnuts and mushrooms instead of fake meat products. With the peppers and tomatoes, these are definitely a more sophisticated and gourmet meatball sub compared to the traditional kind (which I've never eaten either)! i think this is what i am going to feed the tempeh and tofu hating meat eating friends of mine.. this is super amazingly deliciousness and did i say so pretty! i dont like fake meat either! i agree with Cara too.. some genius at work in your head there! Tofu Tempeh haters? what kind of crowd are you running with Richa! Oh. My. Heavens. THIS LOOKS DELICIOUS! Which means I need to find a vegan/gluten free bread I actually like so I can enjoy this sandwich properly. I bet Richa has a pretty tasty Gluten Free Sub roll she could whip up for you! These look so good! We use mushrooms in burgers - they seem to add a great texture! To make these SCD legal or gluten free I would use dried cooked navy beans instead of the breadcrumbs and a bit of almond flour, I don't think I'd even need to use an egg (flax seeds aren't allowed on SCD). You could totally make those substitutions - let me know how they turn out with your adjustments! Thank YOU for stopping by for a visit; I hope you love them as much as I did! Made them yesterday - super amazing! Have these in the oven right now! So excited to put them on my spaghetti! YAY! I made them a second time last week for my book club with marinara sauce as an app (a group of non vegan's) and they were the first to disappear - enjoy them with your pasta! I bet those meatballs are delicious! Something sweet is so good in savory dishes! The pictures are gorgeous as well! Thank you so much for the comment Vicky! I love the combo of savory and sweet! I found these via pinterest. Just made them, am eating them now and had to run over here and tell you THANK YOU - YUM!!! I just love that they are made with all natural ingredients and are so easy to put together. These will be a staple. I cannot tell you how happy it makes me to read your comment - I am SO glad that you made them and loved them! I was raised a vegetarian snd although I do eat meat now, I still love great vegetarian dishes. My mom's recipe did not have dates but otherwise is similar. These sound yummy and I love to balance savory with sweet. Will try them sometime soon. Would work as appetizer meatballs too eith grape jelly and bbq sauce or A1. I came across this on Pinterest and had to make it. Your pictures are beautiful. My usual "meat"ball recipe uses walnuts and seitan, and I love that one - but your recipe was so much easier and faster to make, but just as delicious! This will be my go-to from now on. I omitted the dates (I was afraid they might make it too sweet)... I also added some Italian seasoning. Otherwise, I followed the recipe and they turned out perfectly! I served over angel hair pasta with primavera sauce. Quick weeknight dinner with delicious results! Looking forward to having the leftovers in a sub tomorrow. I'm allergic to walnuts and pecans. Do you think cashews would be a good substitute for the walnuts? Made these tonight (with a few tweaks) and they were very good! Thank you for a great recipe! Thank you for stopping over and sharing! They are one of my favorite weeknight meals, also super good for spaghetti & meatball nights! Hi, Cant stand mushrooms, could these be made using anything else? Tofu? Tempeh? Eggplant maybe? Hmmmm roasted eggplant or a firm tofu may work- I can't say for certain as I never have tried this with anything other than mushrooms- if you do venture and try with another ingredient other than mushrooms let me know how it worked out! awesome recipe...I substituted prunes for dates. I was great. Nice substitute! So happy you liked the recipe, it is still one of my favorites! This looks fantastic. Can't wait to try these. For gluten free did I leave out the bread and the flax egg or just the bread? Thanks! !